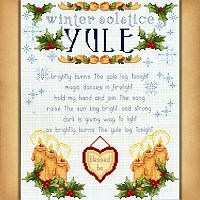 - Candles, snowflakes, and other signs of the holidays surround the text: "Winter Solstice- Yule- Brightly burns the yule log tonight - magic dances in firelight - hold my hand and join the song - raise the sun king bright and strong - dark is giving way to light - as brightly burns the yule log tonight". 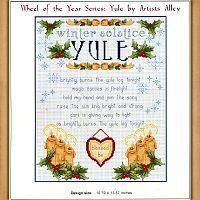 Part of the Wheel of the Year series. Design measures 151 stitches wide by 190 stitches high. This pattern is for counted cross stitch. It is not a complete kit. You must provide your own fabric and floss. 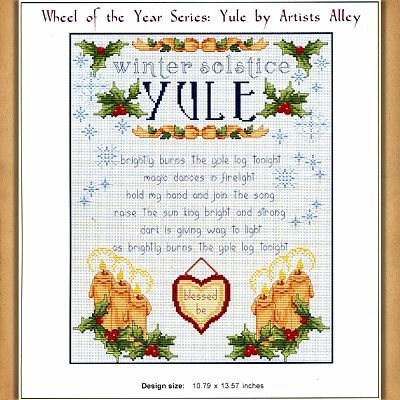 Do you have any other questions about our Wheel of the Year Series: Yule Cross Stitch Pattern?